All transactions are safe and secure with a reliable history in online purchasing behind each of our associates. 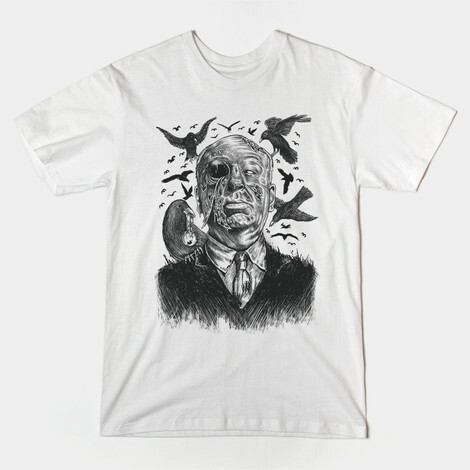 Buy the Alfred Hitchcock Bird Attack t-shirt to own Alfred Hitchcock clothing and merchandise. This Alfred Hitchcock shirt features the legend under attack by his creation, The Birds. Wear it as you watch his movie or the Alfred Hitchcock Presents DVD. Fans will remember it as the American television show he hosted during the fifties and sixties, which was eventually lengthened and renamed The Alfred Hitchcock Hour. Get this t-shirt in the color of your choice and then grab some popcorn and enjoy the suspense! In addition to the Alfred Hitchcock Bird Attack tee above, browse the Alfred Hitchcock Clothing Gallery for more apparel like men's and women's clothes, kids shirts or hoodies.